Hours: 10:00 – 5:00 daily Closed Sat and Mon in winter. This small, simple house on Arch Street is one of Philadelphia’s most famous sights. 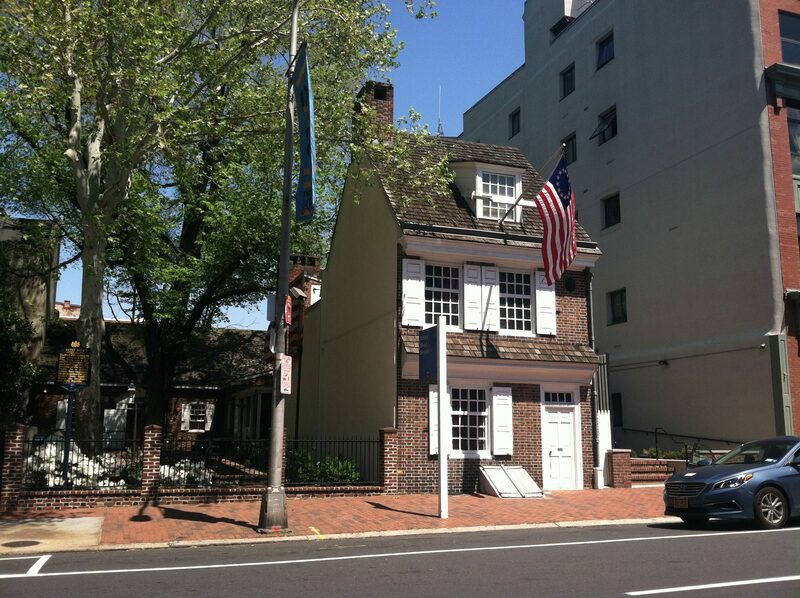 This was the house of Betsy Ross, a seamstress who is credited with designing the American flag. This house is on the site where she allegedly sewed the first flag after a visit from George Washington in 1776. While the story may have been deemed false, and the flag’s true origins are unknown, it still makes for a good story, and has its place in American history. Either way, Betsy Ross was a real person, and lived in Philadelphia. She was originally a Quaker, but became Anglican after her first marriage, to John Ross. During the Revolutionary War she worked in upholstering, making uniforms and other things needed by the Continental Army. Her life was filled with tragedies, as her first two husbands died in the war, as well as her first daughter in 1780. Several of her relatives died in the infamous 1793 yellow fever epidemic, which claimed the lives of several famous Philadelphians. She spent her later years in the countryside, before her death at 84 in 1836. The Betsy Ross House is one of the very few surviving homes in Philadelphia that were occupied by the working class. The house is very tight and the stairways and halls are narrow, as was typical of houses at the time. It may have had a shop in its front doors, as many people would sell their products in the house near the port. A bedroom on the second floor has several items that belonged to Betsy Ross, including a family Bible and bedding from the time period. In the upholstery shop, a woman dressed in colonial attire that talks to visitors about Betsy Ross’ life, while her only known signature is displayed. Several fabrics are seen behind her, as they would have been used in the late 1700s. Another room has furniture that was typical of houses like this in colonial times. Outside, there is a courtyard that has the remains of Betsy Ross and her third husband, John Claypoole, interred beneath. Admission for a self-guided tour is $5 for adults, and $4 for children, seniors, military, and students. The audio tour is $7 for an adult and $6 for children, seniors, military, and students. I must admit that I absolutely hate having to interact with people dressed as historic figures. I won’t let that take away from the score I give this place, but to me, nothing is more awkward that having to talk to someone pretending to be a historic figure. No offense to anyone who does that.